A tribute to popular Indian poet and lyricist Neeraj, who passed away last week. 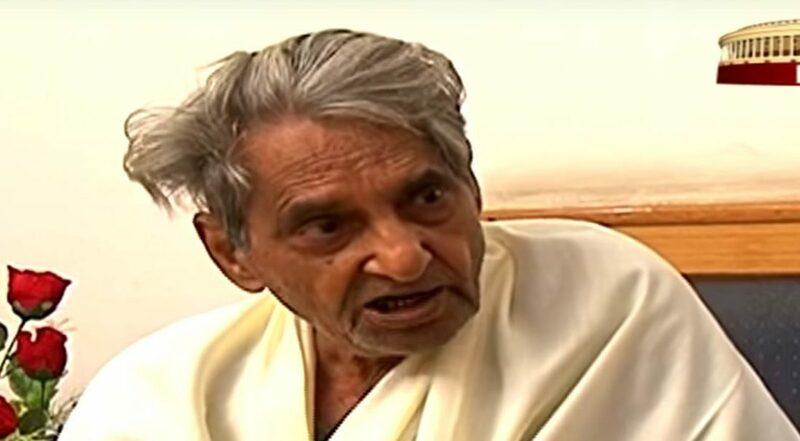 Noted Indian poet and lyricist Gopaldas Saxena, better known as Neeraj, passed away in Delhi on July 19, 2018. He had been ill for some time and was admitted to the All-India Institute of Medical Sciences, New Delhi (AIIMS). Born in Etawah, Uttar Pradesh, on January 4, 1925, Neeraj was a Professor of Hindi Literature in Dharma Samaj College, Aligarh. He enjoyed living in Aligarh nearly till the end. Neeraj first made his mark by writing lyrics for many successful movies and achieved a unique position as a songwriter who wrote with equal ability in both Hindi and Urdu. He stopped writing film songs after the deaths of Jaikishan of the music duo Shankar-Jaikishan and Sachin Dev Burman. jismein insan ko insan banaya jaaye. Chah to nikal saki na par umar nikal gayi. I came to know Neeraj during my student days at AIIMS. A popular song Kaarvan guzar gaya ghubaar dekhte rahe attracted us students to the film Nai Umar ki Nai Fasal, which was running at Sudarshan Cinema Hall, near AIIMS. We used to go to Sudarshan usually for late night show after having dinner by jumping the boundary wall. The cinema management was very receptive of us students and balcony seats were always made available to us. The lyrics in the movie by Neeraj were excellent and they became very popular later. It is believed that Dev Anand, mesmerized after watching him recite kaarwaan guzar gaya at a mushaira in the early 1950s, brought him to Mumbai to compose songs for his movies. Neeraj wrote songs for several hit films such as Prem Pujari, Tere Mere Sapne, Sharmilee, Gambler. Kanyadaan and Pehchan. Neeraj wrote in both Hindi and Urdu, and his work found immediate resonance, as it brought in fresh vocabulary into Hindi cinema, then replete with complicated words. Writing at a time when Urdu had significant play in songs and was perhaps considered a little more cultured, Neeraj brought the beauty of Hindi to music in Mumbai. The similes, for example, were very different from what Urdu offered – togetherness being compared to badal-bijli, chandan-paaani, itna madhur, itna madir, tera mera pyaar – were regarded as enchanting in a signature and unique way. Yaad tu aaye, mann ho jaaye bheed ke beech akela. Well-known Urdu poet Shahryrar and Neeraj, the two great poets and friends from Aligarh, both ventured into the world of films and gained success and chose to come back to Aligarh to spend rest of their lives away from showbiz. In his will, Neeraj had instructed that his body be donated to the Jawaharlal Nehru Medical College of the Aligarh Muslim University. An ultimate unmatched generosity reflecting his ideals of humanity. Neeraj had a tough life in his initial years. Losing father at an early age, he had to do several odd jobs, including working as stenographer, typist, painter of Ayurvedic medicines on walls, spells of pulling rickshaws, selling beedis and cigarettes, and even diving into the river for coins. He taught Hindi at the Dharam Samaj College in Aligarh and later employed as an Information Officer for the Uttar Pradesh government. He was, until a few years ago, the Chancellor of Mangalayatan University in Aligarh and was also accorded the rank of a cabinet minister by the UP government. At the national level, he was awarded Padma Shri in 1991 and Padma Bhushan in 2007.